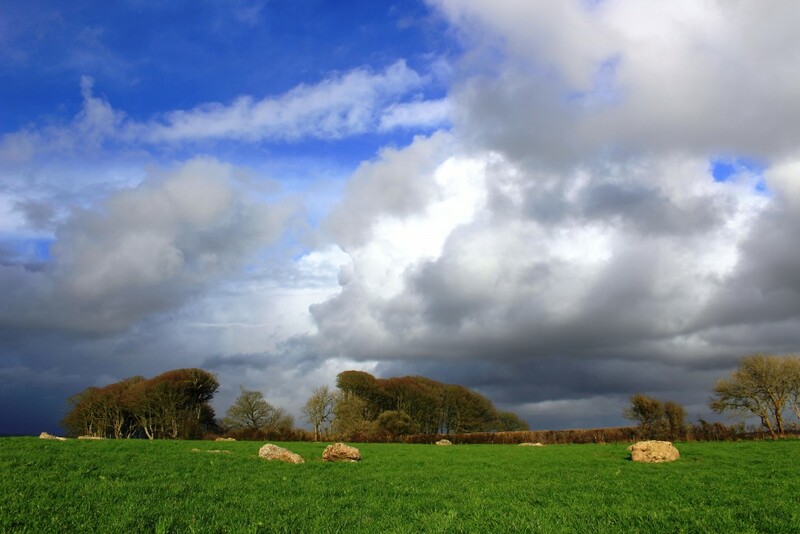 On the morning of 21 March 2017, I arrived at Ninestones stone circle, Winterbourne Abbas at 6 45 am to witness the position of the vernal equinox sunrise relative to the hill running to the southeast of the stone circle and the subsequent interplay of light and shadow on the stones. 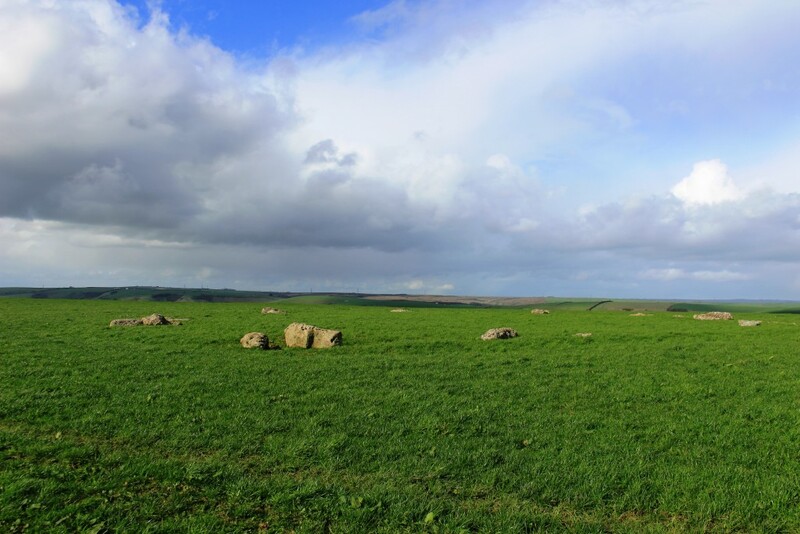 After these observations and a brief visit to several other local prehistoric sites, with the weather remaining good, I decided to spend the afternoon at Kingston Russell stone circle. The route to the site is not signposted and it was approximately a 20 minute walk along a bridleway to the northwest from where I parked the car close to the lane which leads to Gorwell Farm. 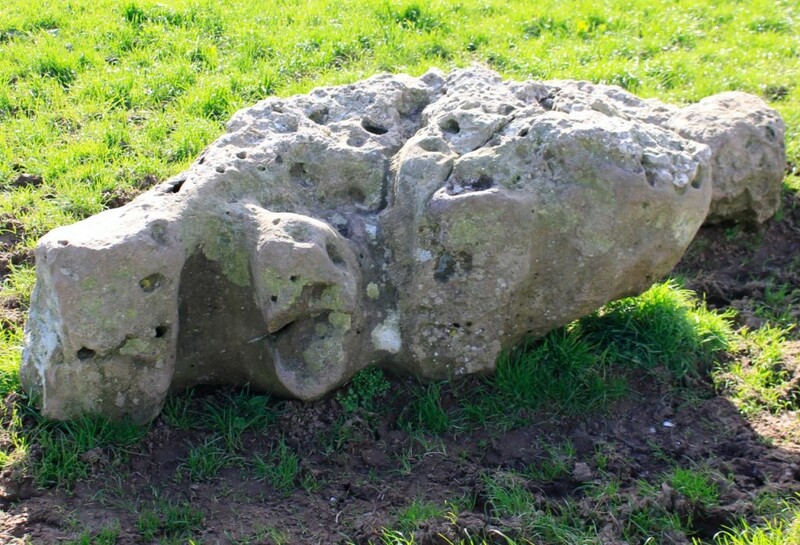 Below is a conglomerate stone at the intersection of the public footpath to Gorwell Farm, the bridleway leading northwest to the stone circle, and a third bridleway heading north to Littlebredy. Paul (Beastie) Baker informed me that this stone has been re-erected in recent years and forms part of the Grey Mare processional way. Initially I took the wrong bridleway to the north, leading towards Crow Hill and Littlebredy, a pleasant distraction, offering panoramic views across Dorset to the north, and the isolated Old Warren earthwork southwest of Littlebredy, said on Historic England’s Pastscape to be ‘the remains of a probable Iron Age univallate hillfort.’ To the east, views were revealed across the Valley of Stones and the distant Hardy monument on the horizon. Below: Looking northwest across Old Warren earthwork, possibly later reused as an Anglo-Saxon burh. Below, looking east across the Valley of Stones towards Hardy monument. 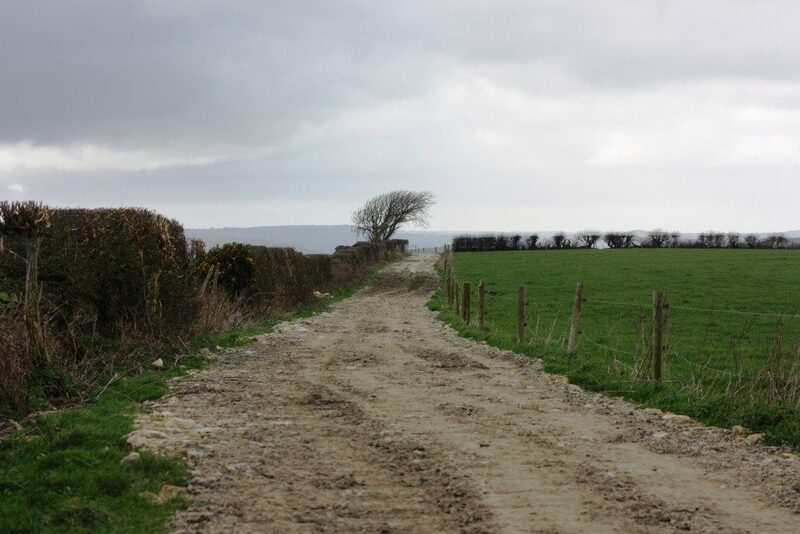 Below: The bridleway immediately south of Kingston Russell stone circle, looking west. Approaching from the east, I was pleased to see the signpost below on arrival at the stone circle, erected by the Ministry of Works in the mid 1950s. Below: Approaching Kingston Russell stone circle from the southeast. 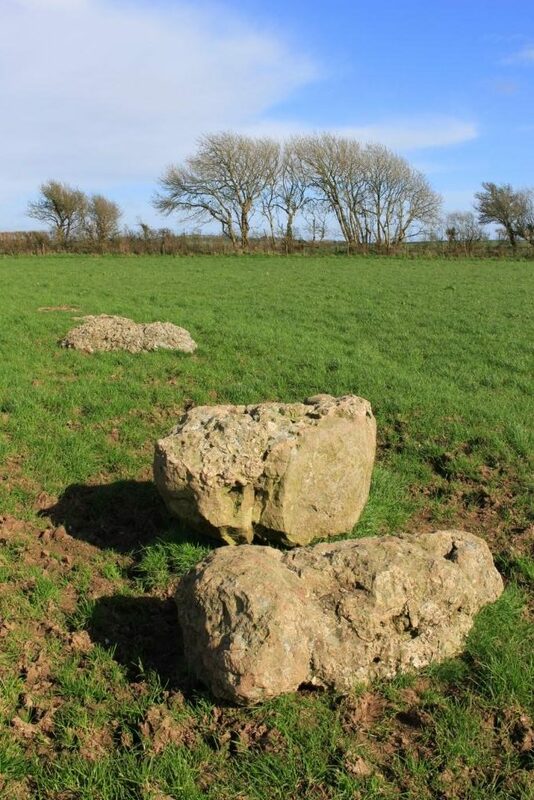 On first visiting a stone circle where I have previously read that the stones are fallen, my expectations of the site are somehow lowered and tempered with an accompanying sadness. 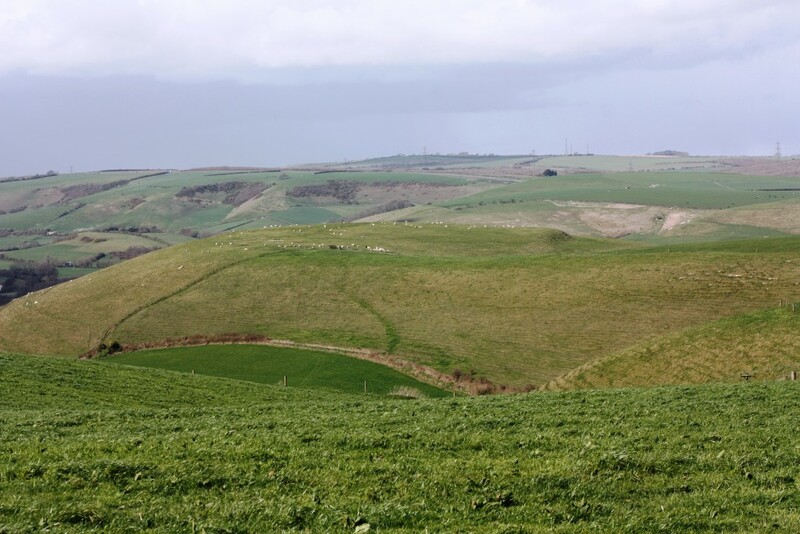 My first impressions here were of an overwhelming feeling of wide open spaces and isolation, with the English Channel to the south, the prevailing southwesterly wind ripping across the site, and open views of the hills of rural Dorset to the north. Both yesterday and today, this stone circle lies well off the beaten track on the road less travelled, and as a result, the site retains a visceral potency of isolation and rawness, culminating for me in a vague feeling that the ancestors somehow left only yesterday. Below: Stone 14 is in the foreground, with stones 13 and 12 respectively behind it. ‘There was a feeling at the stone circle of great deliberation — that this was precisely the right place for these stones’ – The Green Road into the Trees – An Exploration of England, Hugh Thomson. 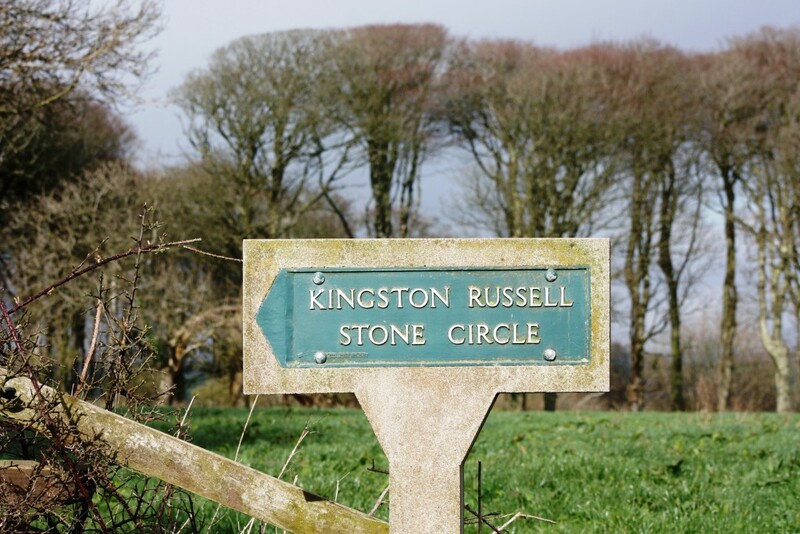 Kingston Russell stone circle is barely mentioned in L.V. Grinsell’s The Archaeology of Wessex, and was likewise generally overlooked by Aubrey Burl and Julian Cope in later publications. In The Modern Antiquarian on page 128 it is referred to as ‘being one of the diminutive circles that disappears into the tall grass in summer’ and does not have a dedicated entry. Such scant recent information, its remote location in Dorset, and the fact that the site remains unexcavated have no doubt contributed to maintaining a welcome low profile. 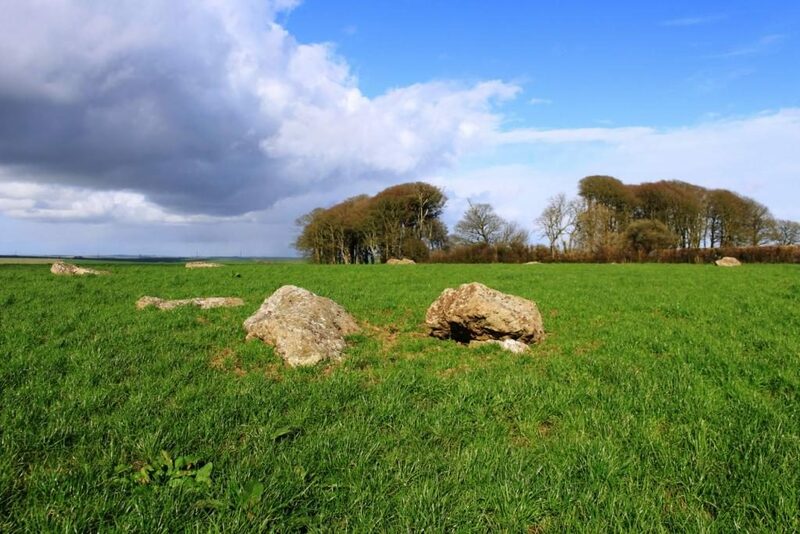 ‘At Kingston Russell Circle there were originally between fourteen and eighteen stones around the circumference of a ring 91 feet in diameter, but it is now impossible to decide which of the fragments are bases and which are broken upper parts. Although it cannot be certain, it seems that this ring was graded in height with the tallest stones at the north. 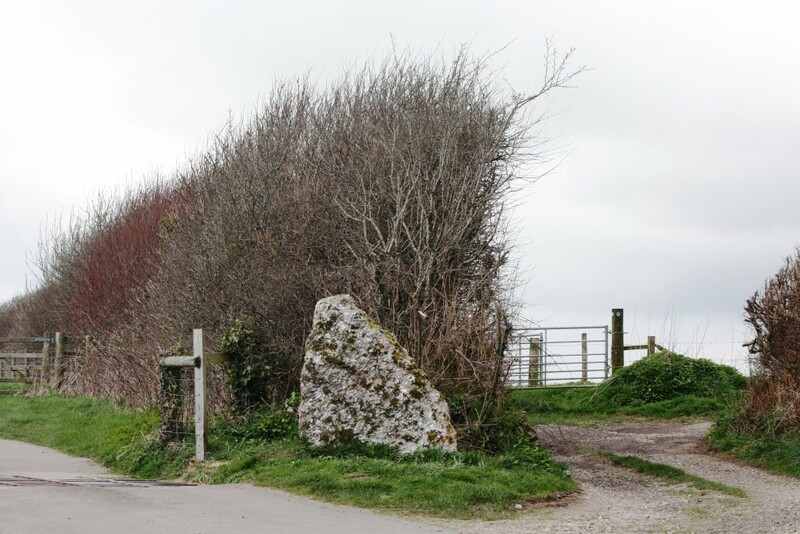 A stone is supposed to have been added to the ring in recent years.’ – A.Thom and A.S. Thom’s (collated, with archaeological notes by A. Burl) Megalithic Rings:Plans and Data for 229 Monuments in Britain. 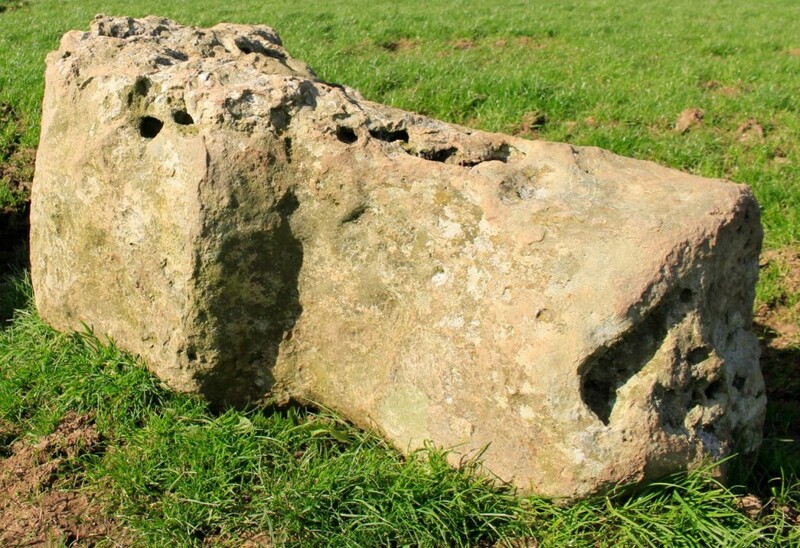 Below: The outer southern face of stone 13 at the south of the stone circle. There is mention in the field notes for the site on The Modern Antiquarian of a rough and weathered possible carving on stone 13, which I have not personally observed. Below: The inner northern face of stone 13. 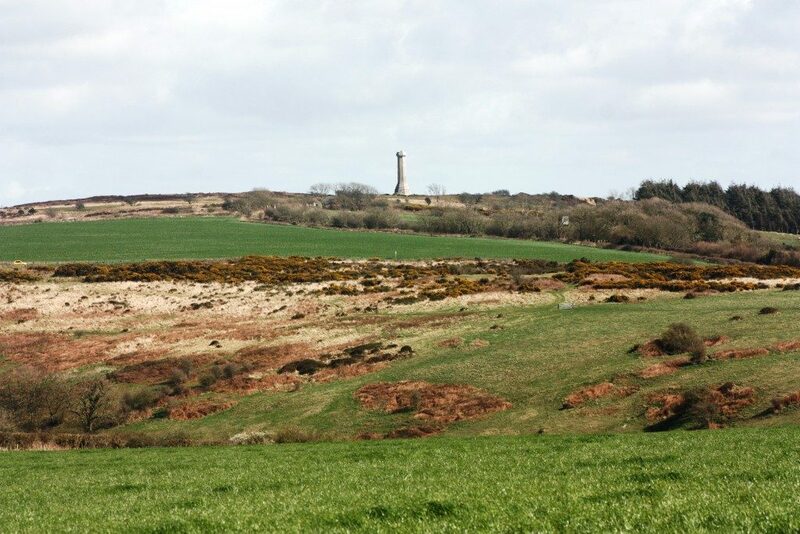 Below: In the foreground from right to left are stones 15, 16 and 17, with stone 18 further to the left in the background and the most northerly stone 1 to its right. As the photographs above illustrate, the afternoon I visited was a blustery mixture of sunshine and cloud. After approximately 45 minutes at the site to the southwest, ominous grey clouds were heading towards the stone circle ‘as if from nowhere’ with what looked like an accompanying band of heavy rain. As the site is particularly exposed, I started to search for the best available shelter in the immediate vicinity. This was in the lee of a tree growing on a small bank boundary of a nearby field. 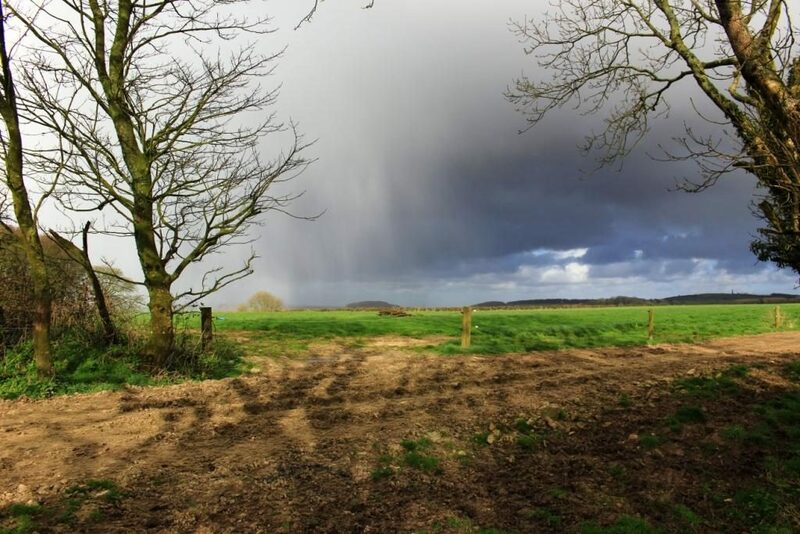 The leaden skies quickly closed in and, as I took shelter, I startled a pheasant, which flew out from undergrowth in the field boundary, startling me. It sent a shiver of fear momentarily pulsing through my body, which immediately dissipated as the clumsy pheasant flew south. 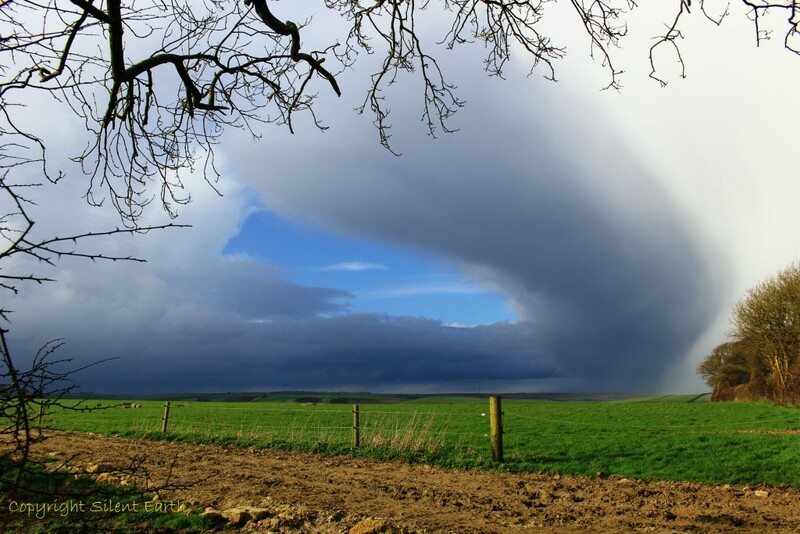 I hunkered down and, with effective shelter from the elements, remained under the tree for a few minutes as a brief but heavy shower of hail — not rain — passed over, quickly melting away to the east. The sky to the west immediately cleared and the sun instantly reappeared, illuminating the landscape once more. 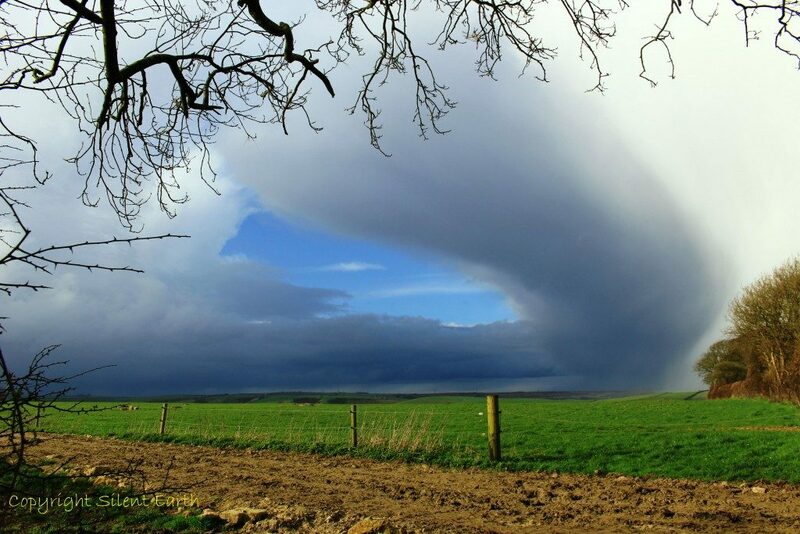 At this time, the striking cloud formation below passed over, for a few moments appearing almost like a vortex in the sky above the stone circle. 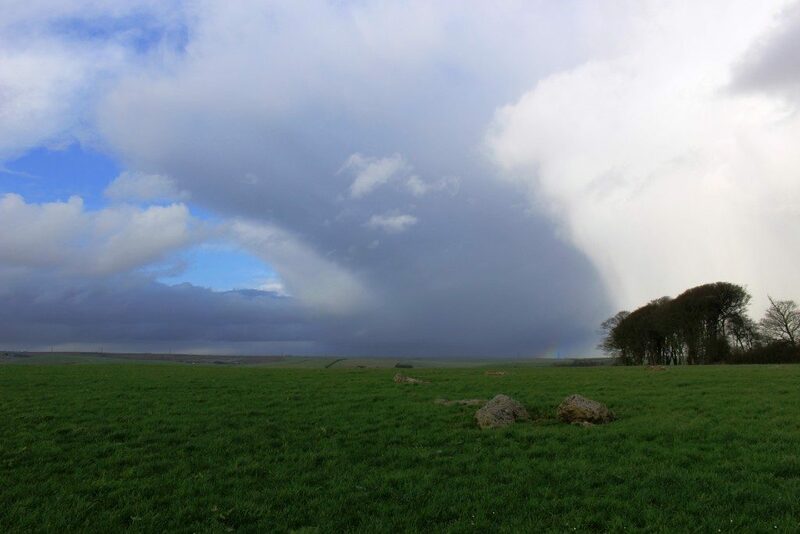 Below: Looking across the bridleway and the field east of the stone circle towards the northeast after the shower of hail had passed over. What of the Immanent Will and Its designs? 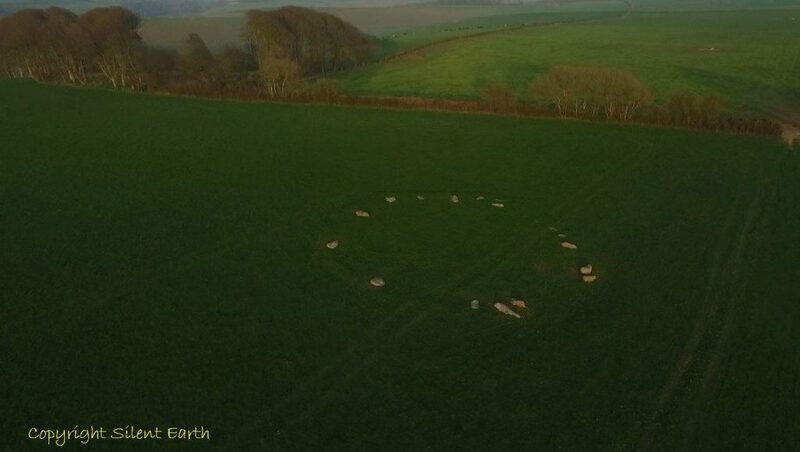 Below: An aerial view of Kingston Russell stone circle.